We’ve lost more than half the world’s species in the last half century, thanks mostly to large-scale infrastructure projects and commercial agricultural expansion. Now a growing number of private and public entities are calling for agreement on making net biodiversity gain a mandatory component of development. 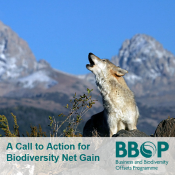 26 November 2018 | Over 200 individuals from conservation organisations, governments, companies and financial institutions have joined in a “Call to Action” for greater efforts to secure “Biodiversity Net Gain” in the context of development. The call to action was issued during Natural Capital Week, where the Business and Biodiversity Offsets Programme (BBOP) launched a new set of roadmaps and guidance for business and government to craft economic development strategies that result in an overall gain of biodiversity, rather than loss.